Owing to the lack of management about my computer for a long time, it is scanned out plenty of duplicate files, I always can’t find handy software to remove duplicate files from computer, until I meet the duplicate checker, not only because it owns great concise dialog box, but also the function is pretty practical. Let’s go to see how to fulfill it. All same files are sorted and grouped presents in front of you, files in one group have the same size, you can recognize them by click any one of them, that row will be colored in blue and others of this group will be in gray, choose one to retain and others of that group could be deleted, always, you need to remove duplicates so many and you are tired of choosing them all. Don’t worry, the bright point function of the duplicate checker could solve the problem easily, just checking one of every group you want to retain and click the <Invert> button at the top right of the interface, then all unwanted files are checked, clicking the <Delete> button at the top middle to remove duplicate files from computer, if you are not satisfied with the result you checked right now, just clicking the < Uncheck All > button besides to the <Invert> button to cancel all checked, instead of checking each of them by clicking mouse. This bright point of the program to find / remove duplicate files from computer only for 4.0 version. And what's more, the checked column in Statistics would vary together with the item you checked, so you can view the size and the number of files that you are going to operate on. The trial version can remove duplicate only one at a time, but you can order the full version on the homepage of duplicate file remover. 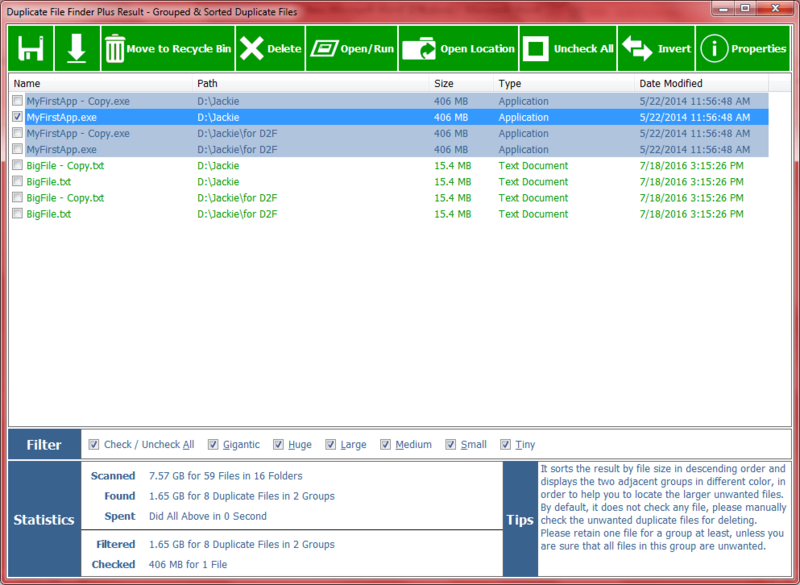 Download Our Duplicate Checker Now!